Queues are one of the things that people hate the most but it is also one thing that people can’t avoid. Almost everywhere, we encounter queues: at the mall, restaurants, cafes, grocery stores, and even comfort rooms have queues. People may hate it but it is actually something that makes things more organized and systematized. Without it, places might be messy, transactions might be out of order, and people might be arguing and complaining about getting the service first. That is why queue management is important and must be taken into consideration by establishments. While a long queue not only has impact on business profits, it also affects customer’s individual experiences. 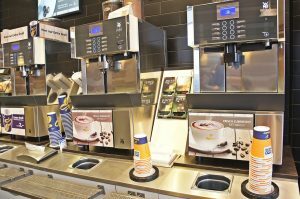 Many companies have also explored the using of technology to come out with commercial queue solutions to help businesses overcome this problem. After all, a happier customer who queue less, would mean more purchases and in turn profits for the business. Anna Arwidi will tell us more about queue management and its impact on customer preferences. Nobody enjoys a queue. At best, we regard them as a necessary evil. At worst, they can be the difference between a sale and an abandoned shopping basket (with customer dissatisfaction guaranteed). In addition to my obvious professional interest, studying how retailers manage the queues in their stores has become something of a personal obsession! When in-store queues can be one of the most negatively impactful aspects of the retail customer experience (and have a significant impact on sales, as research has previously pointed out) it’s surprising that more retailers aren’t using technology to better monitor and manage the queues in their stores, and in doing so enhance the retail customer experience. I have three local stores where I can pick up groceries. All have slightly different propositions (and associated store designs): one is a no frills, ‘stack them high, sell them cheap’ type of place; the second more upmarket with lots of fresh food and an in-store bakery; and the third somewhere between the two with a more limited but specialist range than can throw up surprises and cooking inspiration. In addition to their different offerings, each has its own approach to the check-out area and the management of the inevitable queues. And I’ve found that my choice of store is directly influenced by the experience of the queue (and my willingness to endure it, balanced against what I want or need to buy). Read more here. Using technology could really be effective in an establishment’s queue management system. A said earlier, this kind of queue management system monitor queue behaviour in real-time, and provide data on how many people are standing in a queue per period, and for how long. In this way, there is an easier way to determine things and it is good that the customers too are aware of these pieces of information. Parks are also one of the places where we could see queues. Christy Cabby will give us an example which is the water parks at the Walt Disney World. We have very exciting news for the water park fans out there. The water parks at Walt Disney World currently do not offer FastPass+ selections or any other means of reserving a spot in line other than waiting in the sun in most cases. We have learned that Disney is currently testing a virtual ride queue system that would allow guests to continue playing and enjoying other areas of the park and then notify them when they should return the queue for a much shorter wait. This would almost work similar to a pager system where you will be notified when you should report back. This is different from FastPass+ in that you won’t pre-select certain times, you will get added to the system when you venture to the attraction. The system is expected to be available for guests to try out on April 7th. This should be a favorable change for guests since this will reduce the amount of time that they spend waiting in lines and allow them to go and enjoy swimming, lounging or hanging in the shade until it is time. The technology will only be launched on certain attractions to start out. We haven’t confirmed if it is expected to roll out to all attractions and what that timeline would be. Read more here. Great! People visiting the water parks at Walt Disney World wouldn’t experience the hassles of waiting in line anymore. So the virtual ride queue system will now allow guests to continue playing and enjoying other areas of the park and then notify them when they already have to return to the queue. Another problem experienced is traffic queues. So Stevenmuir wil give us solutions to traffic queues. I was impressed with this image from a story on Aucklands traffic congestion which suggested Aucklanders spend 4 weeks a year stuck in traffic. It’s a great perspective with the queued traffic snarling to a standstill while the lone cyclist has plenty of space to zoom along having a great time. I do have to ask myself the question ‘why aren’t there more people on that cyclepath’? Cycling seems like the perfect solution to me, but there’s obviously a lot of people very grumpy about being inconvenienced by construction of our new cycleways who are not so enthusiastic about cycling. A couple of examples are the irate business owners complaining to Christchurch Council and the dairy owner on Colombo St.
Over the years I’ve noticed some of these stories focus on public transport as the solution (which is a good thing) but some never mention cycling as a practical solution. Why don’t frustrated motorists get on a bike more often? If they live far away, get on an electric bike! If it’s occasionally raining, put on a jacket! It’s not that hard! Read more here. It is true that the road is one of the places where we could see the longest queues. There are already too many cars being driven on the road day by day and we couldn’t really avoid it since we have to travel and do our own businesses around town. However, Stevenmuir has proposed one possible solution to this – cycling. Why not? It would not just lessen the traffic on the road; it would also make your healthier. So there are really many ways where we could make manage queues. We should just think of the something that could benefit everyone, especially something that could make things convenient for the customers. Lena Craig is a 35-year-old scientific researcher who enjoys travelling, meditation and yoga. She is stable and careful, but can also be very lazy and a bit moody.